This round cut pink topaz and diamond three-stone antique-style engagement ring from Apples of Gold Jewelry brings diamonds and pretty pink topaz together to make a unique ring! This antique style ring features a 4mm AA rated authentic pink topaz stone in the center, flanked on either side by two sparkling diamonds, which together total 0.50 carats. Along the 14K yellow gold band you will see six more diamonds, totalling 0.14 carats. The diamonds that are in this ring are rated H-I for color and SI for clarity, and add an extra touch to the bright pink topaz. 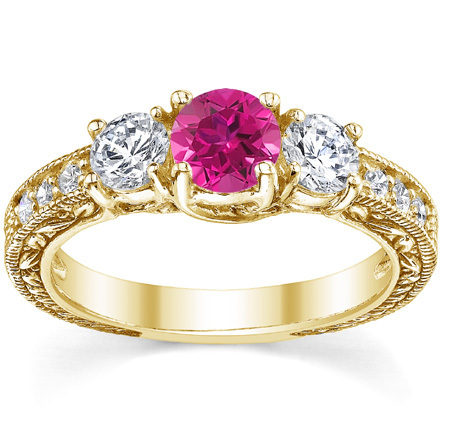 We guarantee our Pink Topaz and Diamond Three-Stone Antique-Style Engagement Ring, 14K Yellow Gold to be high quality, authentic jewelry, as described above.